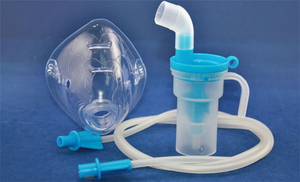 Upper and lower tract nebuliser Adult's mask et children's mask Easy to transport The CN-100P is a compression nebuliser for the everyday treatment of diseases of the upper and lower respiratory tracts. A nebulizer transforms a liquid, either water or a medicine, into a spray of extremely fine particles without the use of heat. Such devices are useful for treating asthma, sinusitis, rhinitis, mucoviscidosis and other respiratory problems. They are often equipped with a mask in the case of serious illness or acute attacks. Different sources of energy are used for atomization. There are pneumatic, electronic and ultrasound models. Some are designed for pediatric use, with a configuration intended to reassure the young user. Choice will depend on size, ease of use and the possible need for a compressor. Portability, sterilization requirements and accessibility of a power source are other factors to consider.